Making Wirearchy operable is hard work. We’ve lived in an environment of identifying problems and creating cause-and-effect solutions for a long time now. That way of going about things is less and less effective all the time, as we encounter complexity more often. Increasingly, beginning and sustaining the journey to a different organisational structure and dynamics won’t yield to a simple and easy-to-implement method or prescriptive approach. There are reasons why it’s not simple and why there is no longer one primary method or prescription. I’d like to explore what I think are some of those key reasons in the rest of this post. For quite a few years now we’ve all been hearing about the advent of the information age, the emergence of a new paradigm, the need for fundamental and transformative change. And while we’ve been nodding in agreement, we’ve all watched as the economic and organisational landscape keeps shifting in front of us and underneath our feet. Now it’s real, or real-er. This funky WO Report about the un-corporation sets out some of the key issues coming at us faster and faster. And yet all too often we struggle mightily to adapt. Many have weighed in on the issue, noting that deep cultural and mindset change is very hard. For example, see Gary Hamel’s The Future of Management and the accompanying MIX (Management Innovation Exchange). They offer a now-widely-accepted perspective on the need for deep change, much of which boilds down to structure and culture. I’ve addressed what I think are some of the key issues in an essay from a couple of years ago titled “Knowledge, power and an historic shift in work and organisational design”. Information is now the raw material of organized human activities. It energizes opinions and feeds our human decisions and business processes with continuous flows of input. But traditional organizations typically insist that information flows follow the reporting relationships and lines of command of the organisational chart. An organization’s IT architecture and the design of its major management information systems (ERP) are almost always aligned with, and support and reinforce, that structure. And so we lumber on, laden with organisational structures and management practices honed and refined from the 60’s and 70’s through to today. The fundamental mindset underneath the methods and practices that inform these organisations are predicated on division of labour, specialisation, efficiency-seeking, optimisation, predictability, etc. These concepts are not bad or irrelevant in and of themselves, but it is arguably the case that their role in the strategies and structures of organisations has changed or is changing. 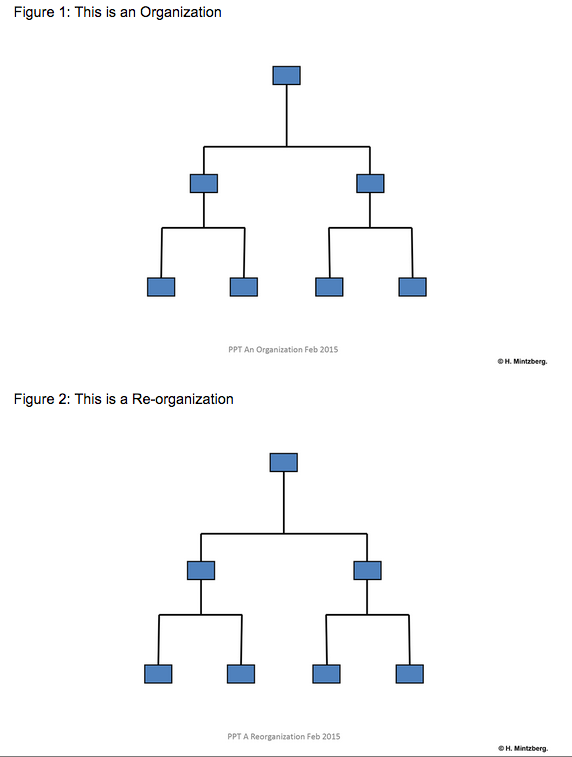 Henry Mintzberg points out the central problem in typically concise fashion, noting that the top figure in the following diagram is an existing organization whilst the bottom figure is a re-organization of that organization. Over the last decade the need to change in deep ways has been growing relentlessl, as connected information-and-people becomes the norm. The new conditions are with us, surround us, and are not going away. First there was Enterprise 2.0, then Social Business, now Digital Transformation and Responsive.org (the Responsive Organisation). The market for ‘organizational transformation’ continually seeks solutions, methods and recipes. It wants maps that can be unfolded or recipes that can be downloaded onto a Powerpoint and followed step-by-step so that the ‘right’ destination appears on the horizon and is accessible. A simple polarity dominates this mainstream market for transformation; the more complex our operating environment becomes, the more simplicity and clarity are desired. 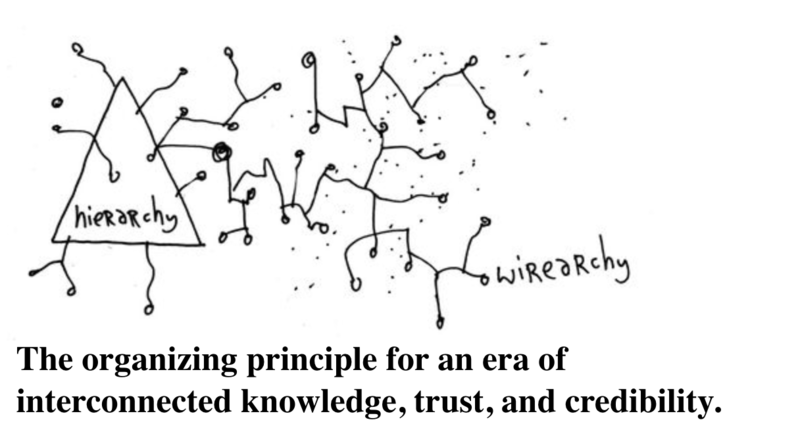 As steward of the concept of wirearchy, I have had many people ask me or prod me to « make it more practical ». However, it is not a method or prescription; it is in effect a design principle to use for thinking about the effective organizing of human activities in a networked environment. There is a fundamental and enduring paradox facing all organisations today. It is essentially unresolvable, unless today’s basic assumptions underpinning the structure of an organisation are challenged to the core of their very existence. Today’s organisations are designed and built on cause-and-effect; linear and optimisable processes can be designed and fine-tuned; specific expertise can be deployed to solve problems, and so on. It is believed that planning forward based on cause-and-effect is effective. And sometimes it is. And yet there are large volumes of research and heuristics that call these basic assumptions into question. Increasingly over the past decade we have hear words and concepts like complexity, resonance, resilience, responsiveness, agility, adaptability, exaptation, feedback loops, and so on. Linear cause-and-effect processes often become brittle when faced with flows of information from connected perspectives generated from many different angles. The industrial era that is now ending was dominated by this cause-and-effect assumption and the models it has spawned. As most know, this dominant model was derived from the application and codification of the principles of Fordism and Taylorism. The codification and enactment of those principles has led to the development of a number of dominant concepts and methods, and the massive growth of a consulting industry. The dominant consulting firms 40 or 50 years ago were small accounting or other professional services firms. They spied the debut of what has become a huge and still-growing market, and adopted and marketed these concepts and methods. As the world has become more complicated and more complex, these firms have become massive and global in scope. These firms long ago learned to promise solutions, and have conditioned their client organizations to buy those solutions. They have continued to do so as the environment gets more and more complex. Selling comprehensive solutions also allows for the deployment of small armies of junior consultants and supports those firms’ business models very well. Over the past five or so years, likely because of an environment of hyperlinked and interconnected information flows between employees and customers, there’s more and more talk of how organisations need to be guided and supported by stewardship-oriented leaders as opposed to isolated top-down decision makers detached from customers and the interactions in markets. Stewardship-oriented leaders understand that organizations are collections of people-on-purpose, that trust is the critical and only sustainable advantage, that constant listening is essential to building a trustful and engaged workforce, and that taking responsibility and instilling and growing adaptability are necessary at all levels of the enterprise. The impulse behind this growth in interest is aimed at facing current conditions head-on and beginning the work and learning necessary to survive and thrive in new conditions. These new conditions will henceforth only be encountered more frequently and with more intensity. That said, the approaches and methods that have begun appearing recently contain characteristics that should prove to be useful next steps towards more responsive, accountable and adaptive organizations. But typically prescriptive approaches are not deep enough, flexible enough nor adaptable enough to be useful in the long term. Implementing them more often than not results eventually in what many employees refer to as the BOHICA syndrome : « Bend over, here it comes again ». In order to realise more fully the benefits of human variety and diversity working together in networked collaboration, those concerned with organizational change and adapting to the new conditions of interconnectedness would do well to work from first principles. It’s essential to ask « why and what for », to consider context and specific industry, market and talent challenges when deciding how to get involved in an iterative process of Design Thinking about major organizational change. 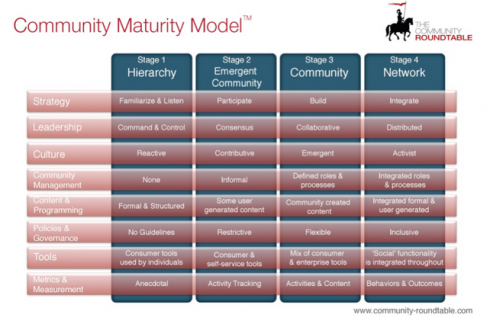 For example, the concept of communities of practice originating in the areas of organizational learning and KM in the late 80s and early 90s have matured, into work communities in the connected workplace and communities of customers connected with enterprises in the interconnected economy. The Community Roundtable, headed by Rachel Happe McEnroe and Jim Storer, has developed over the past several years a Community Maturity model which demonstrates clearly the extent to which the notion of an interconnected and interwoven group of people is a basic structural unit for knowledge work today. Working Out Loud circles, learning circles, circles for Coaching Ourselves, Squads, Guilds, Tribes and Clans; all of these are beginning to seen as obvious and effective practices for worker engagement, but probably would not have seen the light of day were it not for the Web’s connectivity, hyperlinks, information flows and the erosion of traditional hierarchy due to continual feedback loops. An example of a pattern of sorts that has been applied only a few times involves smart and aware young up-and-coming executives recognising that hyperlinks and collaboration platforms are the new environment for productivity. They have also recognized that making disciplined use of many existing OD (organisational development) principles (much discussed but often used in a relatively disjointed fashion over the past 20 years) would result in increased engagement and often enhanced perofmrance and productivity..
A comprehensive leadership philosophy and competency models, values that were well-communicated and made tangible, paying attention to employees’ learning, performance and work-life balance needs are all obvious components of a healthy workplace culture that are all too infrequently not taken seriously enough. A young and aware executive I know took them seriously, and went about using them to create and convert change champions. He and his colleagues took their time introducing and talking through the concepts, “went slow to go fast” and so have led the organisation over 5 years to being a high-engagement, high-performance organization. It is still a traditional hierarchy in most senses. But make no mistake. Connected hyperlinked employees exchanging information on purpose, with purpose, have made a huge contribution to the organisation’s progress. For many working there, the culture has changed in dramatically positive ways. Today arguably it is an enlightened classic hierarchy, or at least more enlightened than most of its competitors. Using fundamental OD principles intelligently and coherently is half the battle. But it is not enough. Hyperlinks and networks as we know them today (online, accessed through a range of social computing tools, with all the power of the past twenty-plus years of information management and processing driving their operations) present fundamentally new conditions. We have a lot to learn yet from a semi-forgotten field of experimentation from the 70s and 80s known as socio-technical systems theory. It has a lot to offer us. 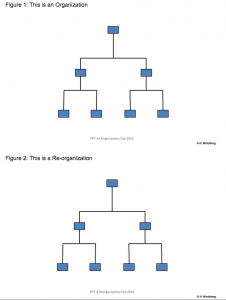 There are very few mature wirearchies; and yet Your Organisation Is Already a Wirearchy. It took at least 40 years for Taylorism and Fordism to become codified into a a set of very similar methods for creating the organization’s structure and managing its activities. is essential in order for an organization to transform rapidly and adapt to an ubiquitous digital and interconnected environment. This typically only accomplishes superficial change that does not deliver significant lasting positive impact on responsiveness, agility and productivity. The design of responsive and resilient organizations and culture begs the issue of seasoned practical conceptual and philosophical advice, coaching and accompaniment. Here are eight considerations I believe are key for decisions about why and how any given organization begins facing the future and taking action to realize constructive and positive change. I believe understanding them more fully is important for coming to terms with the new conditions in which we all find ourselves. 1. Prescriptive widely-applicable methods – yes or no? I firmly believe there will never again be one dominant method or model; however clear patterns are emerging that are effective and pertinent. There will be variations on several themes depending upon the context and type(s) of networked environments and activities. In many ways this issue has been over-examined and over-analysed. Basically, it is clear that hyperlinks and networks are eroding the ffectiveness of « command-and-control » and beginning to urgently demand the dynamics of « champion-and-channel » (champion new ideas that emerge from « anywhere » and channel resources to see if the ideas will grow into something valuable, or not. In addition, there is a long history of exploring, experimenting with and describing self-managing work groups and organizations. Increasingly, examples are coming to the fore, as outline in F. Laloux’s hot new book « Reinventing organizations ». It is hard if not impossible to switch quickly from structured to unstructured or differently-structured organisation. Most of the examples where self-direction and self-management appear to work are cases where the organisation started out with that intention as a fundamental philosophy and then executed and learned and supported a philosophy of ongoing adaptation. This area is not my strong suit, but I try to pay attention. This is an area where any organisation of size already has legacy systems, much sunk cost (especially after the decade and a half of installing massive ERP systems) and often significant polarities appearing in the role of the CIO .. efficiency and control versus flexibility and responsiveness to ongoing change(s) in technological capabilities. There are many imperative strategic issues for CIOs to address, including the growing presence of CDOs (Chief Digital Officers). Some issues, like BYOD, may turn out to be more strategic than previously imagined unless virtually all systems become inter-operable. Today’s management protocols and practices have been designed, refined and optimised for the complicated architecture and dynamics of the Industrial Era. Gary Hamel’s book “The Future of Management” is all about the general lack of response to emergent-and-new conditions. Happily, new and effective ways of responding to the rapidly-growing complexity of today’s new conditions have been maturing and gaining purchase. 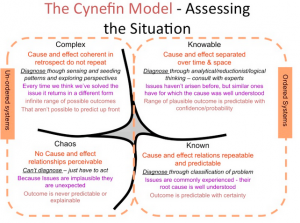 For example, it will be useful to any and all organisation to consider and learn about responsive strategies such as the Cynefin framework (developed by Dave Snowden) for navigating complexity, or other approaches that include tolerance for and constructive use of experimentation and failure. The way work has been designed in the Industrial Era has relied on the conceptual structure known as a ‘job’ for the past 75 years or so. A job has come to mean a set of linearly-defined coherent set of tasks that focus an individual’s expertise and knowledge on predetermined objectives and define (for the most part) the size and scope of the sandbox in which they will exercise that knowledge and expertise. The over-rigid contraints of the concept of ‘job’ began to become more evident in the mid-1990’s. That concept of « job » is clearly undergoing transformation as of 2015. Clarity of roles versus openness of involvement is a polarity or a paradox that may not need to be overly resolved in the unfolding era of networks. But why not both, defined situationally and in near-real-time? If new and inventive ways to address this paradox are not found, the concept of ‘job’ or role will continue to give way to temporary and transient contractual arrangements (this process seems to be well underway already). What has been known as a social contract regarding employment may disappear, at least for a period of time. In my opinion Organizational Network Analysis (ONA) is a key to renewing the pertinence of the work of the Human Resources domain. It can be used in order to identify bottlenecks, under-appreciated resources or poor work design, and to gain strategic perspectives on organizational politics, talent management, organizational change. BUT just don’t spy on employees in order to exploit and manipulate them. Many of the existing ‘tools’ of the HR profession need to be re-designed, if not tossed out and re-designed from scratch. However, not all of what has been obtained from the past must be junked. 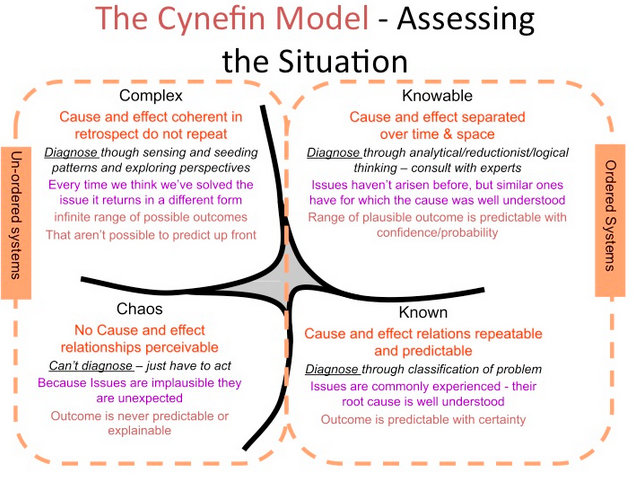 Competency modelling still has relevance, although it needs to be more based on forward-looking adaptation to flows of information and collaboration rather than relying on codifying successful past performance in static roles. Compensation, talent management, performance management and development all need to be re-conceived. Cap executive compensation at reasonable multiples of the average pay of workers in the organization. Any additional compensation would be deferred long-term and tied as closely to the performance and progress of the organization at as a whole, which means probably not the shareholders interests first and foremost (yes, I know that’s not how things work in the real world). Explore the notion of gainsharing rather than pay-for-performance (otherwise known as variable compensation or performance-based pay). Gainsharing is a concept that gained some momentary visibility in the 80’s and (maybe) early 90’s, but then more-or-less disappeared as organizations 1) began dealing in more forceful ways with unions, and 2) focused ferociously on optimization and the deep search for efficiencies. It’s likely that gainsharing (or a modern derivative of the concept) is a more appropriate way to replace or add to the base-salaries of people working in networked environments. In general its philosophical roots are well aligned with the non-technical aspects of humanist philosophy and practices emerging for the more socially-connected era we are entering. We can’t blow up organisations like a set of pick-up sticks. It may be enjoyable to consider the possibility, but it doesn’t really seem reasonable given the general nature of peoples’ socializations and expectations about work in organisations. A method popular in the 70s and 80s titled Requisite Organisation (Elliot Jacques) has some applicability here. Its most recent reincarnation can be found in the methodology titled Holacracy® but (in my opinion) it needs some important updating to consider the flows of information and human energy provided by today’s hyperlinked environment. What management means in this new environment remains to be re-conceived in any substantive fashion, but there is much exploration of the key issues underway, by necessity. Participative and inclusive decision-making and work design must come to the fore; it is essential to provide the space and support for people to learn on an ongoing basis. As Harold Jarche has famously noted « The work is learning and learning is the work ». Adaptability, responsiveness and innovation come from continuous learning. We have been hearing about « learning organisations » and « collective intelligence » for at least two decades now, but it is a real and omnipresent challenge now and into the future. I suggest considering the use of Participative Work Design principles (PWD) and other key principles of socio-technical systems principles to seek an appropriate balance of personal development and augmenting domain expertise under (for example) the guidance of the 70 – 20 – 10 learning framework. All parties involved need to modernize the philosophy about and approaches to areas that represent some solid ground for workers .. for example, unionised work. There are increasing calls for the re-invention and re-instatement of unionisation as the ongoing suppression of pay and peoples’ working conditions continues in the ongoing pursuit of profit at all costs. This seems, clearly, to be the conditions for a « race to the bottom ». We may well have reached the end, the outer limits, of the effectiveness of ongoing reduction of costs and optimisation of processes that has been the primary quest of the last years of the 20th century and first few of the 21st. Much automation and robotisation is on the horizon, and yet humans retain a vital role to play in tinkering and fiddling with, and using information to provide for themselves and to amuse themselves, in both traditional and highly innovative ways. We are living in new conditions never before encountered. We all need to adapt. We can do it the hard way, or we can do it the really hard way. There is no easy way, and what seems easy – following a recipe of that claims to be a solution – is sure to be expensive and to disappoint. What is blindingly clear today is that information technology, computers, mobile devices, information flows carried by hyperlinks on social networks within and external to organizations, connections to customers and markets are new conditions that are not going away. Rather, they will densify and intensify. Organisations and their leaders must believe in and plan for sustainability and ongoing evolution, and must make plans and actions in order to 1) change mental models in fundamental ways and then 2) act on those changes.